This article is about the released remake of Super Mario 64. For the canceled Nintendo 64DD sequel, see Super Mario 64 2. 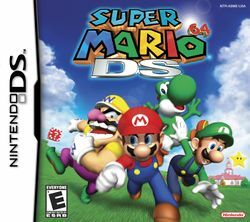 Super Mario 64 DS (originally known as Super Mario 64 × 4 during development) is a 2004 game from the Super Mario series made for the handheld game system Nintendo DS. It was also the first Mario game to be released on the Nintendo DS and is also the first 3D Mario game for a handheld console. The game is an enhanced remake of the 1996 game Super Mario 64 for the Nintendo 64, bearing some new features on its storyline, gameplay, and graphics, and like the original, it was released as a launch title. Unlike in Super Mario 64, Mario is not the only playable character (nor is he even available at the start); Yoshi, Luigi, and Wario become playable characters and can also join the adventure in order to rescue Princess Peach from the hands of Bowser. This is the first and presently only game in the Mario platformer series where Wario is playable, and also one of the two games where Yoshi himself is playable but is neither ridden nor controlled by any of the other characters (the other being Super Mario Run). Other new features within the game include a wireless multi-player VS. Mode, in which up to four players can play simultaneously on each Nintendo DS connected together locally, though this cannot be done on the Wii U Virtual Console version except for the single-player training, minigames to play with each character, and new additions to the story mode such as new courses, missions, and bosses. Princess Peach writes a letter to Mario, telling him to come to her castle because she baked a cake for him. This letter is assumed to be a clever forgery from Bowser, who guesses that Mario and his friends would come looking and so employs his minions to capture them beforehand. Mario arrives outside the castle through a Warp Pipe, followed by Luigi and Wario. The three then make their way to the castle entrance. Yoshi is seen asleep on the roof the entire time, only to be awakened by one of the Lakitu Bros., who reveals that the others have not returned yet; immediately, Yoshi decides to locate them. Yoshi tries to enter the castle, but the doors are locked. The Lakitu Bro. says that he saw a rabbit with the key in his mouth. After Yoshi grabs the rabbit, the rabbit gives up the key to him. When Yoshi finally goes inside, he hears a voice from Bowser telling him, "Welcome. No one's home! Now scram--and don't come back! Gwa ha ha!" Toad informs Yoshi that Bowser and his army have kidnapped Princess Peach and stolen the Power Stars. He also concludes the last time he saw the heroes is when they jumped into the Bob-omb painting. Yoshi then decides to investigate. Eventually, Yoshi starts collecting Power Stars, rescuing Mario, Luigi, and Wario along the way, and the four continue to collect the Power Stars in order to save Princess Peach from Bowser. There are alternate endings for Super Mario 64 DS. The first involves the player not rescuing Wario. During the ending, Mario only lands with Yoshi and Luigi. From then on, the cutscene continues, as does the good ending without the attendance of Wario. In the second alternate cutscene, the player will have to not save Luigi, which ultimately leaves Wario to be left behind too. In this ending, Mario lands only with Yoshi and then the cutscene proceeds lacking the other two heroes. For each alternate ending, a different cake is awarded featuring the characters that appeared in the ending as the cake figures. If the player does not drain the moat, then it will not appear as if it was drained. Also, if the player does not finish Snowman's Lost His Head in Cool, Cool Mountain, then the Snowman's head will not be seen in the ending. "Please come to the castle. I’ve baked a cake for you." At the invitation of Princess Peach, Mario, accompanied by party crashers Luigi and Wario, enter the Mushroom Castle. But when the three don’t come out of the castle for a long time, Yoshi decides to check up on them. Upon entering the castle, Yoshi discovers that no one is there. According to Toad, Bowser has stolen the Power Stars guarding the castle and locked Princess Peach into the walls and paintings. Maybe Mario and his friends have been captured in the paintings, too! Now it’s up to Yoshi to rescue Princess Peach, Mario, Luigi, and Wario from the castle’s paintings and walls! As in Super Mario 64, the courses are accessed by the different paintings on the castle's walls. While up to 120 Power Stars can be collected in the original, the player can collect 150 Power Stars in the DS release, 30 more than in the original game. Making use of the Nintendo DS's features, the player is offered three different ways to control the character. All three modes are always accessible by pressing the Select button. In Standard Mode, the chosen character is controlled with the Control Pad. The stylus can also be used in Standard Mode. Jumping is ; punching, kicking, and sticking out Yoshi's tongue is ; and dashing is . The button is used for crouching, while handles the camera together with the Control Pad. Additionally, if the player presses and holds and presses , the player will wall-kick (if playing as Mario). Compared to Super Mario 64, where Mario was moving as fast as the player tilted the of the Nintendo 64 controller, the characters in Super Mario 64 DS move much more slowly when the run button is not pressed. In Touch Mode, the character is controlled by having the player move their thumb or the stylus across the touch screen. By using the thumb or stylus, the player can adjust the character's speed and direction in a manner similar to what was possible with the Nintendo 64's Control Stick. Jumping, crouching, and kicking are still executed with the buttons. In Dual-Hand Mode, the character is controlled with the stylus, and jumping, kicking, and crouching are done by utilizing either the buttons, for left-handed players, or the Control Pad, for right-handed players. The movement radius is larger with this control option, and all camera adjustments are done with the touch screen as well. The and buttons are not used. On the Nintendo 3DS and the Wii U GamePad, however, the makes for a more authentic feel of using the Control Stick, making for better and easier controls. However, the player will still need to press to run and can still only move in eight different directions. The doors with "M", "L", and "W" above them represent the rooms where the unlockable characters are trapped. After unlocking one, the player can pick and swap characters. To switch between characters, there are three doors, each symbolizing the character's first letter of their name. To use them, the player must go through the door, and the corresponding character will come out of the door. Switching to Yoshi will mean reentering the door that complements with the same character once more. There are four doors in total. However, only the white door is not a playable character and instead contains a secret Power Star, which can be unlocked if the player is able to catch the eight Glowing Rabbits. Once the Power Star is obtained, the player can re-enter the door, but there is no effect afterwards (Boos will be heard), and the player character will simply exit it and groan. In order to fully complete the game, the player needs to find three unlockable characters, who were trapped behind the doors by Bowser. The following table below shows how good each character attributes in a certain statistic. Each has their own special abilities, strengths, and weaknesses. The instruction booklet shows each character's stats and indicates their abilities with stars. However, it omits the rating for swimming speed and does not account for differences in physics that affect the stats. Luigi, for example, while having a higher top running speed than Mario, has a lower acceleration (making him worse in some timed segments). Additionally, each character has different air speeds; Mario's jump is lower than Yoshi's and Luigi's, but he moves farther forward than Yoshi, while tied with Luigi. In the painting worlds and some secret courses, the caps of Mario, Luigi, and Wario can be found and are visible on the touch screen. When a cap is put on, the player's character turns into the corresponding character who owns the cap. He gets all moves of the character who owns the cap, including the Power Flower power-ups, but will keep his original voice. The caps are usually found on the heads of Goombas, Boos, or Dorrie; on land or underwater; or on any other different enemy. When the player is hit by an enemy, the cap topples off and the character needs to retrieve it in a limited time. When the cap disappears, it reappears on a different, set, random location in the course. If Mario, Luigi, or Wario loses their original cap, they cannot pick up any other characters' caps or use Power Flowers until they retrieve their own. They also take double damage when hurt. With Yoshi, a player can select the cap when selecting a Star right after jumping into a painting. If a cap is selected, Yoshi will put it on after entering the course. Yoshi is the only character that can use all three caps. Mario's cap – a red cap that allows the player to turn into Mario. Luigi's cap – a green cap that allows the player to turn into Luigi. Wario's cap – a yellow cap that allows the player to turn into Wario. Coins can be collected by each character. In each course, there are a little over 100 coins, and collecting 100 gives the player 15 extra Stars for the 15 courses. The player gets an extra life if they get more than 50 coins. The highest number of coins that the player can collect is 255. They can be found on land, in the sea, on enemies, etc. They also refill the player's health. Yellow Coins – worth one and are found in most enemies. Red Coins – worth two and have to be collected in the quantity of eight for one episode in each world and some secret courses for a Power Star to appear. Blue Coins – worth five and are often temporary, found in tougher enemies, on slides or invisible until the player hits a Blue Coin Switch. Each of the four characters has a special power from the Power Flower found inside a ? Block, replacing the three caps from Super Mario 64. Only Mario can get something other than a Power Flower from the ? Block, which is the "Wings" (a white feather) to transform him into Wing Mario. Once he has taken the flower, a hero uses his new powers for a short time (about 20 seconds). Notwithstanding, Mario's wing form can last a bit longer, about one minute. If the player hits the box without their cap on, a Bob-omb comes out instead. Additionally, Luigi's and Wario's powers last shorter compared to Mario's equivalent forms in Super Mario 64. Except the fire and floating abilities, Mario now shares his moves with the other three characters. Fire Power Yoshi's fiery breath has the ability to melt ice and roast enemies with fire blasts. 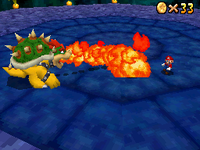 Players use to make Yoshi breathe the fire, which temporarily replaces his lick attack. Yoshi is given a time limit, which restricts the time given to breathe fire. This ability can also be reached with a bonfire, found in the two snowy courses: Cool, Cool Mountain and Snowman's Land. However, this will only give Yoshi one fire breath before the ability is canceled by itself in a short amount of time. Balloon Power Balloon Mario has the ability to float in a puffed out formation of the stomach to reach high-up places. The player must press to rise, while moving in a horizontal direction with the D-Pad. Mario will begin to descend when no buttons are pressed. The ability will cancel if the player presses during flight. The effect will wear off by itself after a short amount of time. Invisibility Power In this form, Luigi has the ability to become invisible and is able to pass through almost any solid matter, except ice. The player can control Luigi as normal. Vanish Luigi is not immune to lava, quicksand, or drowning. The ability will wear off within a short amount of time. He cannot get hurt by enemies, like Metal Wario. Metal Power This form gives Wario the ability to become heavy metal, which gives him more power and invincibility. Merely touching an enemy or walking to it will defeat it and will not hurt Metal Wario. He also sinks, and when submerged in water, he can walk on seabeds. However, Metal Wario will sink fairly quicker than normal in quicksand and lava. Normal controls are used in this form. The ability will wear off after a short amount of time. In addition, there are many rabbits to catch. The rabbits will give up keys to unlock minigame drawers in the Rec Room. Each character catches seven rabbits. Wario catches orange ones, Luigi catches green ones, Mario catches pink ones, and Yoshi catches yellow ones, for a total of 28 rabbits. Since Yoshi has one key to open up the castle, there are eight yellow rabbits, instead of the regular seven. 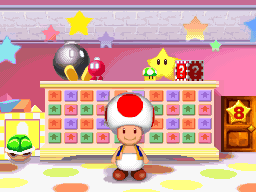 To make the rabbits appear, the player must talk to Toad in the Rec Room. The following table displays information pertaining to the whereabouts of each rabbit, which minigame its related key unlocks, and the number of Power Stars that are required to make the rabbits appear. For more information regarding the minigames unlocked, view the section about the Rec Room. However, there will be eight Glowing Rabbits that will be randomly placed where a regular rabbit that has been caught used to be. Three keys are used to unlock Mario, Luigi, and Wario. They are obtained after boss battles. Mario's key is obtained once Goomboss is defeated, Luigi's key is obtained once King Boo is defeated, and Wario's key is obtained once Chief Chilly is defeated. Upon catching all of the eight Glowing Rabbits, the player receives a key that opens the white room in the character switch room. The first time to open it and enter, a character finds a Power Star. However, if the character comes back after taking it, Boo laughs can be heard, and the hero comes out from the door, startled. At the beginning of the game, after catching a rabbit, near the small hedge on the left of the castle, Yoshi gets the key to unlock the castle's front door. After clearing the first two Bowser levels, the player receives keys to access the basement and second floor, respectively. The following table displays information regarding each course, the Power Stars found within each course, how to get the Stars, and what character is required to obtain the Stars. During some missions, the player can find a cap of another character that will transform them into the character that owns the respective cap. The number of caps in a course varies and is based on which characters have been rescued, with few exceptions. Yoshi does not have a cap but is able to choose from the rescued characters before selecting a mission. When the player's coin meter reaches 100 for the first time in a particular course, a bonus Power Star appears, making a total of eight Power Stars available in each course. If the player receives a Star and redoes the mission, the Power Star will appear as blue and will not count toward the total. Secret Stars are Power Stars found in hidden locations in and around Peach's Castle. There are thirty Secret Stars in all, fifteen more than in the original game. According to Bowser, he did not know the whereabouts of most of them. Bowser is fought in three courses, each of which is behind a Big Star Door, and a certain number of Power Stars are required to open them. Big Star Doors can only be opened with Mario, though once opened, any character can enter the door. The only exception to this is the Big Star Door leading to the final Bowser course; if any character other than Mario enters through it, they will be brought to the Endless Staircase instead. The following table shows all of the major bosses in the game. The following table shows all of the mini-bosses in the game. Super Mario 64 DS includes a multiplayer VS. Mode, which can be played with up to four players by using the wireless communication. The host player must press the orange icon labeled "VS", while the other players must press DS Download Play on the main menu. To change settings, the players can press the start and select buttons. When the DS systems are connected, the host player will select a stage. There are 4 stages in total. Once the stage has been selected and the settings are changed, each player will fight and compete to get the most Power Stars and Coins within the time limit. After the round is finished, the results will show the ranks of the players with the most stars and coins. 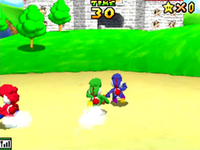 All players in this mode play as a Yoshi; the first player (the host) plays as the default Green Yoshi, the second player plays as Red Yoshi, the third player plays as Blue Yoshi, and the fourth player plays as Yellow Yoshi. Despite the color differences, each Yoshi has identical abilities, and all are able to pick up the caps of Mario, Luigi, and Wario to use the abilities of those characters. All of the characters are able to fly. The Rec Room, entrance with Toad standing in front of the open shelves. Once keys are gained, they can open shelves to unlock minigames. Mario's and (to a lesser extent) Wario's minigames are action-packed, Luigi's are casino (or luck-based) games, and Yoshi's are puzzle-based. The following table is a complete listing of all the minigames and descriptions, which includes also the unlockables, throughout the game. They are followed by the in-game instructions. Most of these minigames are reused in New Super Mario Bros., and they also have multiplayer, along with some new ones. For information regarding how to unlock the minigames, view the section about Rabbit locations. There are 36 minigames in total. Each character has nine: two are for the characters themselves, while the other seven are from catching rabbits. Wanted! It's easy to get lost in a crowd! Find the one who disappeared and touch him. There he is! Loves Me...? Play this minigame for advice on your love life! Pluck the petals to find out how your crush feels about you. Hide and Boo Seek Rub the Touch Screen where the Boos are hiding! For the first 15 levels, you get three seconds to find them. After that, you only get two seconds. Puzzle Panel Match the Touch Screen picture to the top screen. Touch a panel to turn over the surrounding panels. Harder levels will take more turns to solve. Boom Box Each time you open a treasure chest, you'll hear a sound. Open 2 chests with the same sound. Win by matching all the pairs. Tox Box Shuffle Oh, no! Yoshi's trapped in a Tox Box! Find which one he's in to save him! Which Wiggler? Touch the Wiggler on the Touch Screen that matches the one on the top screen. Choose carefully, though; he has a terrible temper. Mix-a-Mug Line up the slots on the Touch Screen to form a face. Win more coins by matching the center face in the slots to the one on the top screen. Puzzle Panic This minigame takes the Puzzle Panel to a whole new level. Put on your thinking cap. You're going to need it. Mario's Slides Guide Mario down the slides to the Star. Draw lines on the Touch Screen to create new routes for him. Collect 5 Stars to move up a stage. Bounce and Pounce Mario's in free fall, but he can bounce back if you touch him. Stomp the Fly Guys, but make sure he doesn't fall off the Touch Screen. Sort or 'Splode Guide Bob-ombs to the black carpet and Bob-omb Buddies to the pink carpet. If you bring in a wrong-colored Bob-omb, it will blow up! Trampoline Time Draw a line on the Touch Screen to turn it into a trampoline. You can draw up to 3 lines at a time. Help Mario bounce to safety! Shuffle Shell Use the paddle to push the Koopa shells to the target. The closer the shells land to the center of the target, the more points you will earn. Bounce and Trounce Mario's surrounded by Fly Guys to trounce. Touch him on his left, right, or center to make him bounce in that direction. Connect the Characters Draw lines to match the characters' heads to their bodies. Press "GO!" when you're finished to see how you fared! Shell Smash Hit Koopa shells together to score points. Hit many in a row for even more points. Score even higher points by smashing green shells together. Trampoline Terror Only players with superb stylus skills will be able to make Mario bounce through the rings. Memory Match Pick two matching cards to make them disappear. Clear all the cards to win. Pair-a-Gone Touch 2 identical cards that are connected vertically, horizontally, or diagonally to make them disappear. Clear them all to win! Picture Poker Get a better hand than Luigi to win! If you're confident your hand is best, increase the number of coins you bet! Mushroom Roulette Guess where the ball will land on the roulette wheel. Guess correctly to win coins! Mario Slot Touch the spinning slots to stop them. Get 3 items in a row to earn coins! The Superstar is wild. Lucky Stars From a pair of cards, pick the one with more Stars to win coins. Beat Luigi at his own game! Pair-a-Gone and On This game of Pair-a-Gone goes on forever! Test your skill and see how many cards you can clear. Go for the record! Memory Master If Memory Match was a piece of cake for you, try out this harder version. You now have more cards to play with. Super Mario Slot Touch the spinning slots to stop them. Get 3 items in a row to earn coins! The Superstar is wild. Are you feeling super lucky? Bob-omb Squad The parachuting Bob-ombs are destroying your flowers! Use your slingshot to knock them out of the air. Hit Lakitu to blow them all up. Snowball Slalom Rub the Touch Screen to roll the snowman's head to the goal before time runs out! Rocks will slow you down, as will touching his head! Bingo Ball Launch a ball into a numbered slot on the Touch Screen. That number will light up in the top screen. Get 3 numbers in a row to score! Coincentration Pay attention to where the falling coins land. Touch the blocks to retrieve the coins. But if you choose the wrong block, your game will end. Psyche Out! Are you psychic? Can you guess what's on the card's other side? Maybe if you stare at it long enough, a vision will come to you. Slots Shot The bars swing open when a ball goes in a Piranha Plant. Sink the ball into the pipe to trigger the slots Switch. Get 3 items in a row for a bonus! Lakitu Launch Shoot as many balls as you can into the tubs within the allotted time. Intense Coincentration There aren't as many falling coins this time around, but that won't stop Wario. Watch the coins carefully! Giant Snowball Slalom Roll the snowball over a longer course! As before, avoid rocks because they'll slow you down. Though Super Mario 64 DS is a clear remake of the Nintendo 64 64-bit game Super Mario 64, there are some elements that were components added in the game that the original game did not have, as well as elements only seen in the first rendition which were taken out in its remake. Luigi, Yoshi and Wario are now playable. Only Mario was playable in the original, while Yoshi makes an unplayable cameo appearance on the Castle Roof after the original game is finished and Luigi and Wario did not make any appearances or cameos in the original. There were, however, rumors that Luigi could be unlocked in the original, but those have since been debunked, and he was planned to appear in the original game, but was dropped. Utilizing the stylus and touch screen, the player can now draw and stretch the characters which appear on the title screen. In the original game, Mario (the only character capable of wall jumping in both the original game and the remake) cannot slide down walls. He is able to do so in the remake, making Wall Jumping much easier to perform than in the original. Mario is able to float, Luigi can become invisible, Wario can become a metal version of himself and Yoshi can breathe fire out of his mouth when anyone collects a Power Flower. Mario can also fly by collecting a feather. In the original, Mario was able to collect different caps to use these various abilities (excluding the fire and balloon power-ups) such as the Wing Cap, the Vanish Cap and the Metal Cap. There are eight Power Stars in each world. In the original, there are only seven Power Stars in each world. There are 36 rabbits to catch. In the original, there is only one rabbit which is caught twice in the basement. There are 150 stars in the whole game. There were 120 in the original. Wario is now able to pick up signs and throw them like any other enemy that is picked up. He is also able to jump on signs and ground-pound them into the ground once. In the original version, Mario is not able to pick up signs, nor is he able to ground-pound them. He and the other characters can't pick up signs, but can ground-pound them twice. After collecting all Stars, the player may be shot out of a cannon to the top of Princess Peach's Castle. Three 1-Up Mushrooms can be found there, as well as one of Luigi's rabbits. Also present on the roof is a red ? Box, which gives the player a feather for Mario and a Power Flower for Luigi, Wario and Yoshi. In the original game, Mario will find Yoshi on the Roof. He will award the player with 100 lives, a new animation for his Triple Jump, and jump into the waterfall. The Mushroom power-up was added, mainly found in bricks, and causes the player to grow to an enormous size (and gives Yoshi punching abilities). Within a time limit, one can defeat virtually every enemy, something that couldn't be done in Super Mario 64. After destroying the first seven, the player receives an extra life for anything else they destroy. A 90's Got Milk commercial shows footage from Super Mario 64 featuring a giant Mario, but it was impossible in the original version. Yoshi appears on the title screen if the player returns to it without turning the game off, or if the player touches the Yoshi icon. As the Nintendo DS does not have the analog stick that the Nintendo 64 has, either the D-pad or the stylus can be used (depending on the settings). However, the Circle Pad on the Nintendo 3DS somewhat simulates the classic analog stick. On the title screen, Mario or Yoshi's face can be dragged by the stylus. While being dragged, they become wireframe. The user can also design a custom picture to drag around. In the original, Mario's face can be pulled by the cursor. The L and X buttons on the Nintendo DS control the camera. In the original, the C buttons on the Nintendo 64 control the camera. Rabbits, when caught by the player, can unlock minigames in the Rec Room. In the original, a rabbit provided hints and/or a Star. Silver Stars were added in the remake. During Silver Star missions, the player must collect five Silver Stars to make a Power Star appear. In the original, a glitch can cause Mario to backwards Long Jump. In the remake, backwards long jumping is possible, but will not have the same effect as in the original. The player is given three save files to play on. In the original, the player was given four. Mario couldn't destroy things that Wario could do in this game. He and the other characters also cannot even do it in this game. Star Switches are seen in this game. They make a Power Star appear for a limited time in a Star Sphere. The doors to Peach's Castle are now locked and require a key, which is obtained from a rabbit. Two Power Flowers appear in the mirror room of Peach's Castle (four if the ones through the mirror are counted), but only if Luigi is used. In the original, no power-ups appear whatsoever in the room. In the original game, Mario's cap did not despawn when losing his cap in Snowman's Land. In the DS version, when Mario loses his cap in Snowman's Land, it gets stolen by Mr. Blizzard. Upon the game's start-up, Mario does not say anything on the Nintendo logo screen and says "It's-a me, Mario!" only on the title screen. In the original, he says "It's-a me! Mario!" on the Nintendo logo screen and "Hello!" on the title screen. When a pipe appears at the start of a new game, Mario pauses before saying "Ha Ha!". In the original, he immediately says "Ha Ha!" after saying "Yahoo!". When the Big Boos are hit in the original, they make the same sound as the Thwomp, but they do not do it in the remake. When Mario goes to sleep after idling for too long, he does not talk in his sleep, though this may be because it would have to be recorded for the other three characters. The penguins in Cool, Cool Mountain have slightly different crying sounds than in the original. When entering Rainbow Ride, the sound effect for entering a mini-course plays; in the original, it plays the sound effect for entering any other main course. When the player first enters Big Boo's Haunt in the original, they are greeted with, "Come on in here... ...heh, heh, heh..." They are not greeted in the remake. In the original version, Big Boo's laughs in the mission Go on a Ghost Hunt are written as "Ka ha ha ha!" In the remake, "Ha ha ha ha!" is written instead. King Bob-omb of Bob-omb Battlefield is obsessed with his mustache. In the original, he is not shown to have any particular interests. In the original game, when Mario throws Bowser, he says "So-long-a-Bowser". He does not say that in this version, instead, he says "Buh-bye", which he also says after closing the DS. After collecting a 1-Up Mushroom, the words "1-UP" appear in orange text. In the original, no on-screen icon appears. Princess Peach wears her hair up in her appearances instead of wearing her hair down. This is based on how she appeared in Super Mario Sunshine which was the debut appearance of her ponytail hairstyle. All textures are redone to fit the new capabilities and resolution of the system. The sun and moon found in level skyboxes are now separate objects from them. Additionally, the pyramids seen in the background of Shifting Sand Land are no longer present. In the remake, coins are octagonal, but in the original, they are circular. Additionally, they are 3D objects in the remake, while they were 2D animated sprites in the original game. There are red ? Blocks and yellow ! Blocks. In the original, all item blocks are ! Blocks, and appear in blue and green, with the red ? Block sharing the functionality of the red, green, and blue ! Blocks of the original. Wario, Luigi and Yoshi figures appear on the cake at the end, along with those of Mario and Peach (with Wario and Luigi only appearing if the player has unlocked them). Only Mario and Peach are seen in the original game. Several enemies have updated designs. Many of the designs from this game end up becoming the standard for later games. Cheep Cheeps (or Bubs) were depicted as resembling Blurps with an orange, scale-like texture and plain fins, but have a traditional design in the remake. Bubbas were depicted as a larger version of the aforementioned Cheep Cheeps with shades, but due to the Cheep Cheeps looking on-model, they were revised to look more like Boss Bass. In the original, Boos have blue eyes and are oblong, but in the remake, they have black eyes and are more spherical. Mr. Blizzards have zig-zag mouths and wear buckets like hats, while in the original they have circular mouths and wear nothing on their head. They also die by spinning (similar to Mr. I) instead of falling on their side. Lakitu's Cloud looks less like a real cloud and has a happy face, while in the original it resembles a normal cloud. Additionally, Lakitu is smiling in the remake, while in the original, he looks unhappy. 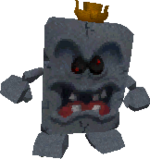 In the original, Thwomps are blue and cube-shaped, while in the remake, they are a gray-green color, spiked, and rectangular. Despite the spikes, the player can still stand on top of them. Whomps now have gray rectangles for hands instead of purple spheres. Heave-Hos have their faces replaced with a pair of digital eyes. Skeeters are now light blue instead of turquoise. Scuttlebugs no longer resemble orange marbles, instead having bee-like stripes. Bob-ombs and Chuckyas now have keys. Moving Bars no longer have eyes in Whomp's Fortress. Pokeys now have their Mario Kart: Double Dash!! appearance. Unagi's markings are now a bright yellow. Large variations of enemies no longer use a scaled version of their smaller counterpart, instead having more detail. Snufits are less spherical and wear black masks instead of white. Fly Guys have visible mouths. Spindel has one row of bandages instead of three. Monty Moles have a new design with a double upper lip. Bullet Bills have a design similar to the old artworks, but silver, without a mouth, and black arms. The original game's version resembled a Banzai Bill. Spindrifts are tan and have closed mouths. Kuromame now resemble active Flame Chomps and have been renamed after their Japanese name, Keronpa. Amps have white lips, yellow eyes, and lack the original design's cross-popping veins. The projectiles Mr. Is shoot is turquoise and glowing, instead of a purple bubble. Swoops no longer have visible teeth, but have yellow, red, and purple details. Big Bob-omb now has white gloves instead of yellow. The Whomp King now has a crown and a more chipped, irregular shape. Big Bullies have spiked rings around their horns and red rings around their eyes. Wiggler now turns red after the second hit, and looks angry throughout. He also has spots and a mouth. Bowser no longer has a disproportionately-large head. The toxic cloud in Hazy Maze Cave is purple; it is green (or yellow) in the original. The toxic cloud also pushes the player back a little in the remake, but not in the original. Bob-omb Buddies now have red feet instead of orange feet. They also have a fuse. The bottom layer of Whomp's Fortress has been expanded significantly, adding space for a Star Switch and its respective Power Star along with several new enemies. The interior of the igloo in Snowman's Land has been entirely changed in the DS version. In the original, during the final scene after the credits (after everyone waves goodbye to the player), the cake awarded to Mario is displayed and the player must reset the system to continue playing. However, in the remake, after the cake is shown, pressing any button takes the player back to the title screen. The door on the top right corner of the lobby only contains two Peach murals (one still leading to The Princess's Secret Slide), as well as five additional doors. 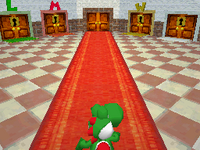 The three doors with letters above them allow the player to switch between characters; the remaining door contains a secret Power Star and the door in the back center leads to the Rec Room and Goomboss Battle. In the original, the room is smaller and contains three Peach murals inside it (one leading to the Secret Slide). Klepto appears in three different levels, while in the original he only appears in the level Shifting Sand Land. Whenever Hoot gives his speech, he isn't frozen and still flaps his wings. Additional music is played slower and is similar to the Wing Mario music. When the player flies with Hoot, he flaps slower than the original. In the original, Hoot is frozen when he gives his speech and his wings flap faster. Unlike the remake, in the original game, two Toads accompanied Princess Peach. When the player puts on the Mario cap for the first time, the game states that the player must press to do a wall jump. This is incorrect, as the player must press to wall jump. Despite the instruction booklet giving Yoshi's jumps a 3-star rating, his long jumps and triple jumps do not go as high and far as Mario and Luigi's do. King Boo is mistakenly referred to as Big Boo. The 50 Star by the third floor has the carpet texture sound instead of the normal floor texture sound. The instruction booklet is written in a vertical format and has a mistake where Mario and Luigi's speed are similar to the rest of the characters, except Wario. In fact, Mario and Luigi are the fastest in running and swimming. Even if the player has collected the Star, a star that has been collected by Unagi, Klepto, or the caged star in Tall, Tall Mountain will show a star that hasn't been collected yet when untouched by the player. If the player enters the Tower of the Wing Cap without Mario's cap, the Wing Cap will still be on Mario. Mario will even have his cap on until he leaves by any method. Even if Yoshi's mouth is full, he can still make sounds. Page 23 of the game's instruction manual shows a screenshot of Mario on Star 3 in Bob-omb Battlefield. The Silver Stars on the Touch Screen are mistaken for actual Power Stars. Super Mario Bros. 2 - Luigi has the same scuttle jump from this game. Super Mario Bros. 3 - The music for the Rec Room is an arrangement of Grass Land's music. The music for the minigames Wanted!, Connect the Characters, and Mario's Slides is an arrangement of the minigame music. In the minigame Loves Me...?, if the player wins three times in a row, an arrangement of the tune that plays when Link uses the Recorder can be heard. Wario Land: Super Mario Land 3 - Wario's gameplay is like that of this game. Super Mario World 2: Yoshi's Island - Some of Yoshi's moves and animations are based on this game. Super Mario 64 - Mario retains some of his voice clips from this game. Yoshi is seen on the castle's roof in the beginning, which is a reference to this game. Also, some of Peach's voice clips were reused from this game. Mario Kart 64 - Some of Luigi's and Wario's voice clips are reused from this game. Yoshi's Story - Yoshi's voice clips are from this game. Luigi's Mansion - Some of Luigi's voice clips are from this game. Also, King Boo imprisoning Luigi is a reference to his doing so to Mario in this game. King Boo's laugh is also the same. Super Mario Sunshine - Some of Mario's voice clips are recycled from this game. In addition, Sunshine Isles uses the music from Delfino Plaza, and other music can be heard in some minigames (Luigi's games use the theme from Casino Delfino, and some other minigames use the a cappella version of the original Super Mario Bros. theme song from the secret areas.). Wario World - Some of Wario's moves, attacks and his voice clips are the same in this game. Mario Kart: Double Dash!! - Some of Mario, Luigi, Wario and Yoshi's voice clips are recycled from this game. Also, the star in the box art is reused from the art of this game. Mario Kart DS - All the bosses reappear in Mission Mode of this game, with each one fought after every eight missions. Also, some of Mario, Luigi, Yoshi, and Wario's quotes and sounds are reused here. Tick Tock Clock is now a playable course. New Super Mario Bros. - Most of the minigames and enemy models from Super Mario 64 DS are reused in New Super Mario Bros.. Also, when the DS is closed in both games, Mario will say, "Buh-bye! ", and when the DS is opened back up again, he will say, "It's a-me, Mario!". New Super Luigi U - The portrait used to enter Big Boo Battle is reused as a hidden Luigi. Mario Party: Island Tour - The song "Slowly Bubble Up" from this game uses a remix of the song that plays for the minigame Wanted. Mario Kart 8 - Mario Kart DS's race course Tick Tock Clock returns as the first track in the Retro Lightning Cup. For a complete list of media for this subject, see List of Super Mario 64 media. The game was initially announced as Super Mario 64×4. This iteration featured co-op multiplayer, different graphics and slightly different level layout among other things from its certified release. A fully functional red Koopa Troopa enemy, as well as additional 3D objects and 2D animated sprites, is present in the game's code and can be accessed with an Action Replay code. Nintendo DS Carig Harris, IGN 8.9/10 "At the very least, you can depend on at least one game in the system's launch line-up to bring hours, days, and weeks of great fun on the new hardware, even if it may not exactly be the system seller people are expecting out of the Nintendo DS' launch window. While I would have loved to experience a brand new Super Mario game that incorporated and integrated the system's capabilities, it's at least great to experience a well-produced and expanded version of a tried-and-true formula." Nintendo DS Jeff Gerstmann, GameSpot 8.4/10 "All things considered, Super Mario 64 DS is a great update of a classic game. While some portions of the game have aged better than others, and while the control could've been a little tighter, the game is done right enough to make it a faithful update for fans of the original; new players will certainly find a lot to like here, as well. This is clearly and deservedly the flagship game for the Nintendo DS launch." Nintendo DS Kristan Reed, Eurogamer 9/10 "On the whole, in this reviewer's estimation, the DS more than lives up to expectations. If anything, there was little excitement about it in this corner of the EG camp in the run-up to release, and although it'll be interesting to see whether the presence of a second screen will make any real difference, it's the touch-screen gaming that has really made the difference - although it's telling to note that so far it's only been genuinely useful in games actually designed around this input, as opposed to shoehorned into accommodating it as with the main portion of SM64DS. You've got to hand it to Nintendo, though; it's moved the gaming goalposts again. Or rather it lets the players do it themselves this time." Nintendo DS Jeremy Parish, 1UP 7.5/10 "So what we ultimately have in Mario 64 DS is a poorly-conceived port of an otherwise good game. It pains me as a Mario fan to hand out a less-than-superlative score to any version of such a classic, but the simple fact is that all of Mario 64 DS's new additions can't overcome its problems. If I want to play Mario 64 again, I'll do it on the system it was designed for (and at about a tenth of the cost of a new DS). In the meantime, I'll hold out hope that the mysterious New Super Mario Bros. title teased at E3 is the game that Mario 64 DS should have been." Following its release in Japan, Super Mario 64 DS sold over 241,000 copies in December 2004. Super Mario 64 DS is the 10th best selling game for the Nintendo DS, and as of March 31, 2014, the game has sold 11.03 million copies worldwide. The game was produced by Shigeru Miyamoto, who also served as the supervising director, and directed by Shinichi Ikematsu. The main system programmer was Toshio Iwawaki, the other system programmers were Kenzo Hayakawa, Yuichi Yamamoto, Kenji Matsutani and Hiroshi Umemiya. Sometimes, when the player long jumps under a falling pillar in Jolly Roger Bay, the pillar will be destroyed, and the player stay squished until the player loses a life. Note that this only works in Version 2 of the game. Luigi: His body will be invisible, but his head will remain the same. Mario: Everything will be normal, but he will have wings growing out of his head. Wario: The game will freeze the instant the Power Flower is touched. It can also be used to find the debug screen. This glitch can be performed with any character (although Mario should not have wings). First, to perform this glitch, the character would have to go to Bob-omb Battlefield. Once he is on the mountain trail, he should enter the first cannon by a Goomba, a Brick, and a tree. Then, the character should aim so that the tip of the bottom arrow aligns with the tip of the bottom of the floating island. Then once the character fires, he makes a glitchy movement going back and forth and then passes through the fence at a certain angle and will end up on top of the mountain instantly. (caught by Yoshi) "You...can't...EAT...ghosts! Eee hee hee!" (to Wario) "Eee hee hee...I am Big Boo, the scariest of the spirits. Eek! What's this?! Your face...It would even scare a ghost. How horrible! You've got it backwards...I do the scaring around here! All right, now I'll put some real fear in that frightening face of yours! Eee hee hee!" (defeated) "Augh! The scariest one wins, and your face is flesh-creepingly frightening. Good thing I don't have any flesh! Eee hee hee! This is not the end. See you again." (to Yoshi) "Yoshi...Yoshi... (pops Yoshi's bubble, waking him up) Listen... Mario hasn't returned yet..."
For this subject's image gallery, see Gallery:Super Mario 64 DS. The title screen of the Korean release, which doesn't have "Rec Room". The minigames, and by extension the rabbits that have the keys to unlock extra minigames and the Toad that appears in the Rec Room inside Peach's Castle, are removed in the Korean version. The Japanese and Korean version colors the word "Super" in many colors rather than just one color, making it look a lot like the original game's title screen. There is an orange ! Block along the red ? Block on the roof of Peach's Castle in the Korean version, rather than only the ? Block in the other releases. This ! Block gives the heroes to an extra life: the block doesn't disappear, so that they can easily earn up to 100 lives. The artwork of the castle on the box art is different from the design in-game. The design on the box art is actually based off the castle that appears in Mario Circuit from Mario Kart: Double Dash!!. This also applies to the Power Star seen on the box art. In the title screen, if the player taps Mario or Yoshi's face, a drawing of Mario or Yoshi (respectively) appears. 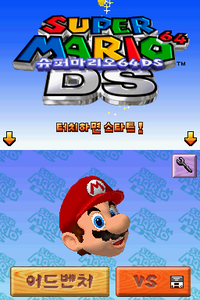 The third time the player taps Mario's face, a Luigi drawing will appear instead. The UK version of the game's manual mistakenly reads, "Thank you for selecting the SUPER MARIO™ Game Card for Nintendo DS™ systems." instead of the full name. The original European version of Super Mario 64 DS got a PEGI 3+ rating, however due to content regulations in Europe growing stricter over the years, the European Virtual Console re-release instead got a PEGI 12+ rating because of the gambling in Luigi's minigames. This also applies to New Super Mario Bros..
↑ Nintendo Life (December 21, 2015). Nintendo Download: 24th December (Europe). Nintendo Life. Retrieved December 22, 2015. ↑ Super Mario 64 DS Instruction Manual. , pg 2. ↑ スーパーマリオ６４ＤＳ. Nintendo. Retrieved November 16, 2016. ↑ 슈퍼 마리오 64 DS. Nintendo. Retrieved November 16, 2016. ↑ 神游马力欧DS. iQue Ltd. Retrieved November 16, 2016. ↑ Nintendo. 2005. Super Mario 64 DS instruction manual (UK version), pg 2. This page was last edited on April 19, 2019, at 01:01.